Walking into Sushi Roku on Third Street, I noticed cords of rope hanging from the ceiling, called “nawa-noren” which are symbols indicating the establishment is a traditional Japanese restaurant. The lighting enhances the Japanese theme and the long sushi bar. “We have the longest sushi bar of all the Sushi Roku restaurants,” said Joe Ando, assistant Manager of the Hollywood location. “We also have an incredible Sushi Master, Juri. He has been here since the restaurant opened in 1997. The most popular seats in the restaurant are the two at the sushi bar in front of Juri,” Ando said. Juri was born and raised in Los Angeles. After he finished high school, he went to Japan and apprenticed with some of Japan’s greatest sushi masters for four years to become a sushi chef back here with Innovative Dining Group. 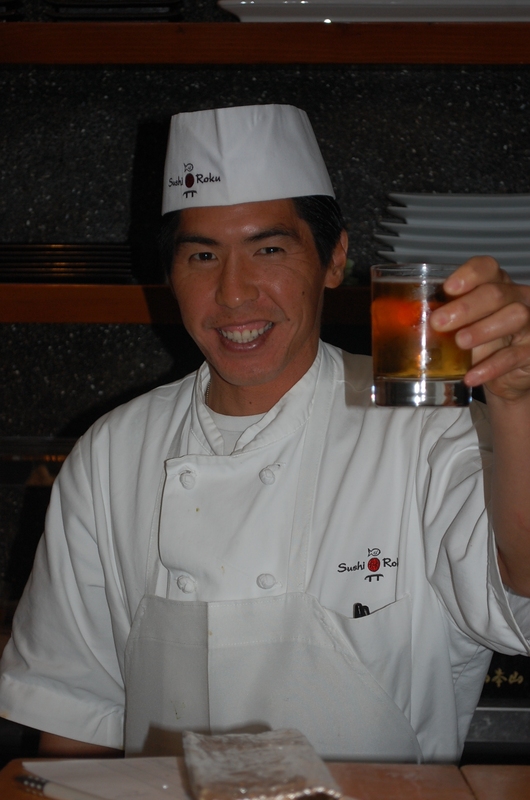 Juri found his home at Sushi Roku, where he weaves elements of cuisine from all over Japan. Read the rest of my review by clicking on this link via Sushi Roku. Courtesy of the Beverly Press newspaper.